I've designed this new free pattern for my Loulouthi fabrics, which you can grab off my MAKE page, and we've prepared kits over here for each of the palettes. This one above is a throw size, made up of 9 blocks, and from the Juliana palette. 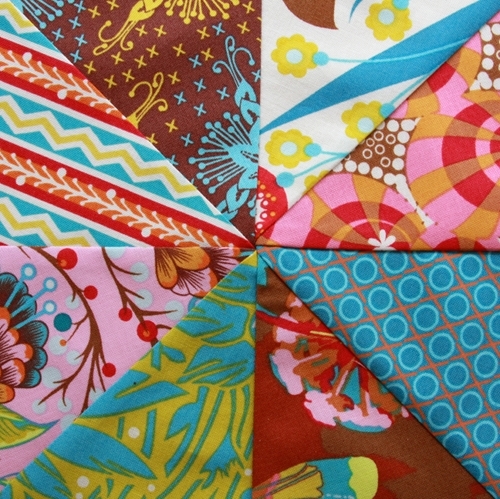 While I do love the messy, mix-y , patch-y of a quilt, I decided to play around with some solids too. Its amazing how different these quilts with the solid bands are. And how the solid influences the feel and color story of the whole thing. This solid aqua is paired with fabrics from the Eleni palette. I also backed this one with voile, which makes your needle just sink right in beautifully if you are handquilting, and who wouldn't want a layer of that against you on a cool night? So soft. It was such a push to get each of these finished before market, so I had some help from my pal Brittney to piece two of them (thanks Britt!). 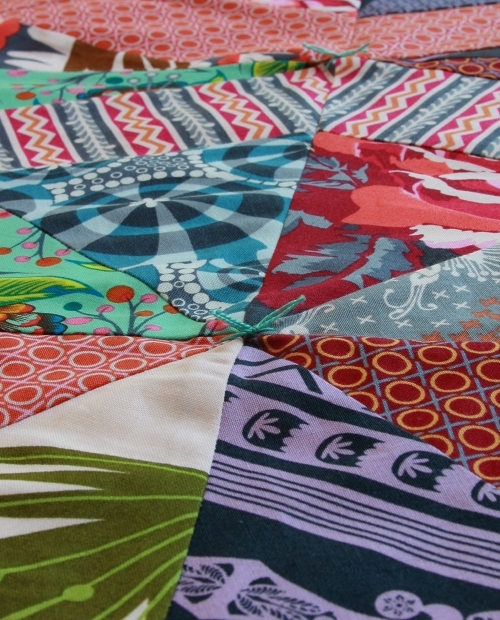 And while its not really recommended to bind up the edges before you quilt the layers together, market will push you into just that kind of corner. So it came along just like this, safely pinned, and waiting to have the stitching realized (as it still waits). The main reason I introduced solids to these is to have some open ground to feature hand stitching. So on the above I'm a little torn between tying and stitching. Hmm. Every quilt I design is like a new friendship, and you learn something. What I've learned from this one, is that I gravitate towards blocks that have a center, as do these pie shapes, and so the background stars. 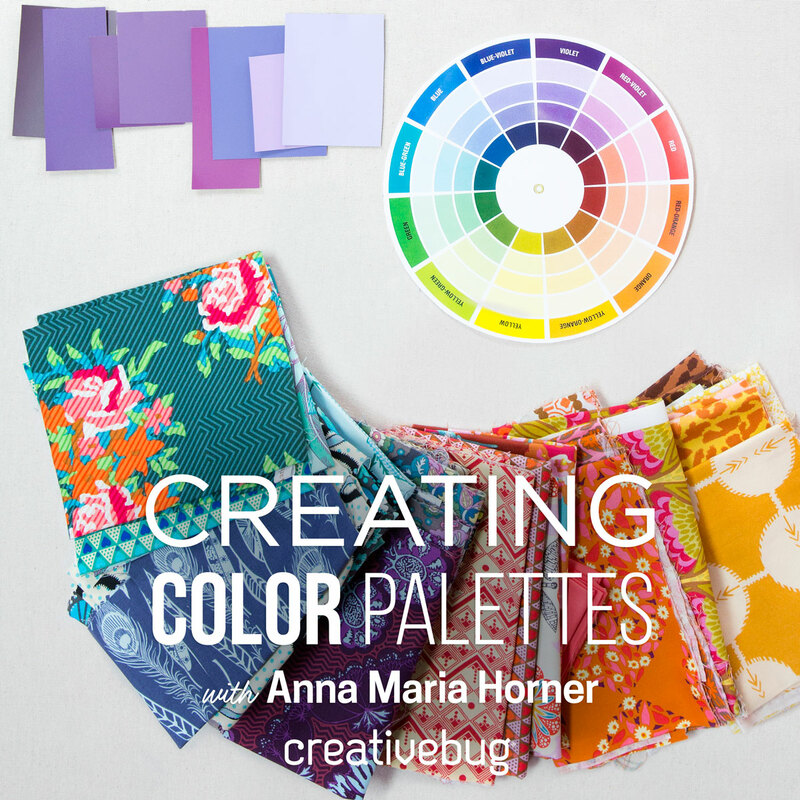 There is so much power play that can happen between the two, depending on how the color and depth arrangement gets fooled with, that you can really go on and on. Which is just the point to all this I believe. And I did-go on, and on! This is a crib size version from the Isabela palette, and I love it! So fun to hand stitch in playful primaries. And extremely enjoyable to allow the background stars to be really graphic, using high contrast colors from the gold and blue. I think I like this poppy-ness partly because its a small-scale, playful quilt. I put a solid voile on the back of this one, to give various hues of stitching center stage. Spinning Stars. I hope you enjoy it! I had no idea when I was drawing it up a few months ago that it would be such a summery, starry tie-in to the upcoming holiday. Hooray. Wow! All stars! These are each so beautiful and appealing. Thank you so much for the free pattern it is stunning. Love those solid bands in there, especially the aqua! Wow, those are amazing. If I haaaad to pick a favorite, I think it would be the last one. Just perfect. What a wonderful quilt and you have given instructions for different sizes. I wish we could get more of your fabric here in Great Britain more easily. Thank you for the pattern. And it would be good if we could buy the lovely thread too. Sarah. These really are beautiful quilts. What a cool way to showcase your new fabric collection. At first I really loved the patchwork look of the Juliana version, but the more I read and look, the more I like the other two versions, equally, with the solids and stitching. I've always wanted to hand-tie a quilt, and wondered if it would provide enough quilting to hold the layers intact. Love the look on these beauties! Totally gorgeous! I'm in love! I will make one soon! I'm totally obsessed with this. I love how you mixed in some solids. Anyway, you should know I'll be making this ASAP and most likely in Innocent Crush. :D I finished up my Loulouthi quilt top today and I'm excited about handquilting it! Thanks for the pattern, AM! Fantastic! 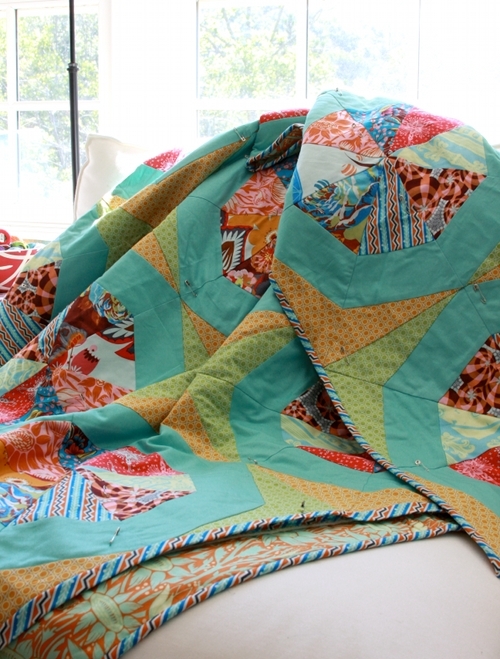 I always feel like indulging in a tied quilt is something I should feel guilty about. However, I can never quite muster that guilty feeling because the ties are just simplistic bits of texture that make my heart sing. I think the technique is especially joyous in this quilt. As is the hand quilting in the second one. As always, you're providing lots of inspiration! Thank you! Have a safe holiday weekend. Gorgeous! 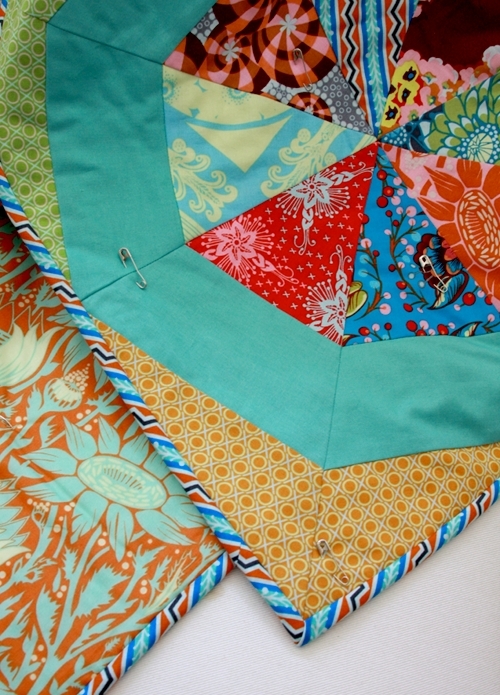 I love the way your fabrics look pieced together in quilts. 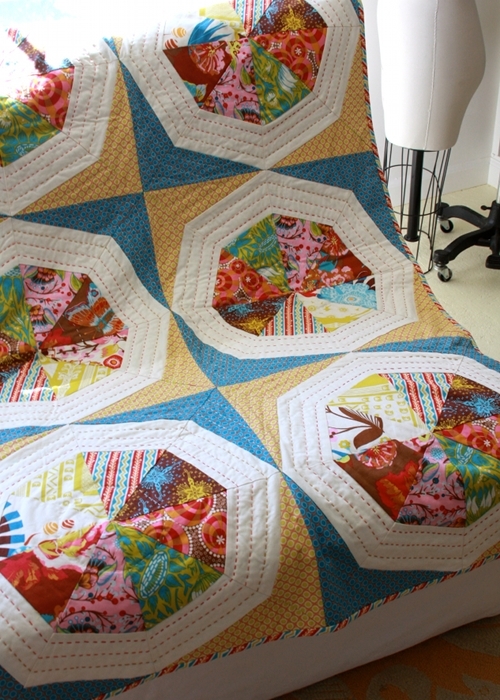 I was smitten with the first one until I saw the solids mixed in, what a beautiful way to showcase hand quilting! Thanks so much for sharing the pattern. I love that quilt! You are just so talented and so generous to share with us! Thank you so much!!! It's just gorgeous!! So beautiful! I've never done any hand quilting before, but this definitely inspires me to give it a try! Beautiful. Love the solids background. I LOVE the hand stitching on the solid fabrics. It's so beautiful! I know I already commented, but could you perhaps post a picture of the whole quilt with the blue rings? I apologize if it is pictured on the pattern (I can't open it for some reason, but I'll figure it out for sure). Sorry for two comments! A thing of beauty is a joy forever - your hand stitching is such a pleasure to see, always! An inspiration. Very beautiful quilts! OMG, I LOVE that crib quilt!! The hand quilting is beautiful - how do you find the time?? Gorgeous! Really loved the colors you used on the 2 last ones, as well as the sneak peak earlier :) Thanks for the pattern!! i absolutely love the one with the solids. it is perfect. the handquilting makes it even better. 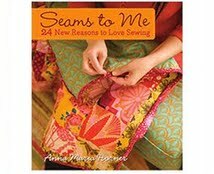 you're inspiring me to give handquilting a try. Thanks so much for the pattern. 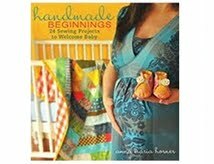 I love the one with the solids and hand quilting. Just the inspiration I needed. i love all the colours! so cozy! Beautiful! I really love the hand stitching with the solids! These are so beautiful. Just love the one with solid color in it too. The bright colors are amazing. Love the quilt! The last one with the stitches is absolutely cute! off to buy some aqua freespirit solid! yum! Love the baby quilt with the hand stitching! The last one is especially lovely to me. I ca appreciate each print more because the solids let my eyes rest and showcases the prints. 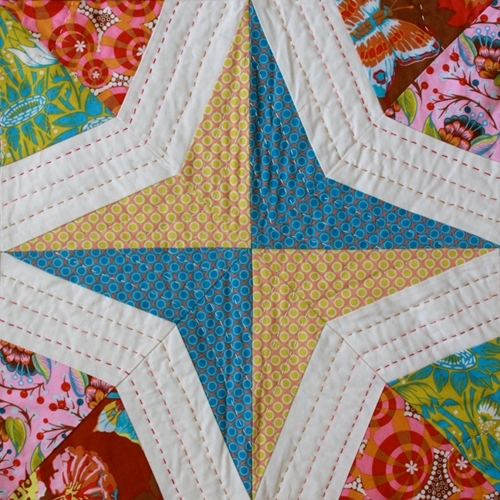 Love the colored quilting too! Oh so beautiful!! I love it!!! 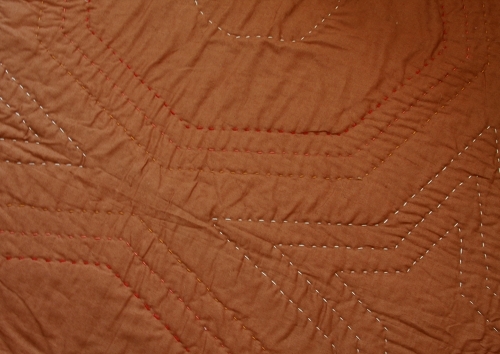 I absolutely love the contrasting quilting thread. Gorgeous! I saw this and fell in love ... when I saw the pattern, I felt a bit intimidated. I decided to create a test block to see if I could manage and fell in love once again. The ease of this pattern is incredible. 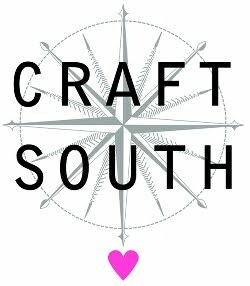 I muddle through picking fabric, ironing cutting out templates, cutting fabric, and stitching it together in under 2 hours! 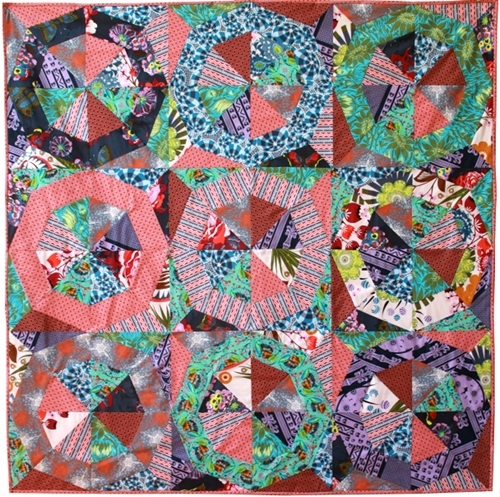 I can't wait to make my Isabella Spinning Star Quilt. I have a hunch this will become my go to pattern for baby quilts! I love the idea of voile for backing and hand quilting. Thanks very much for creating a easily made, stunning quilt! I have just begun to follow your brilliant example of quilting with embroidery floss. My vintage re-pieced quilt top, which is edged in white, now has hand-drawn, embroidered/quilted flowers all along the border, and the process is liberating from the tiny, tiny stitches in ecru that I used to make. Your stars are a beautiful example of this technique! Wow I love the hand quilting! That must have taken so long! I love your work, just beautiful! Beautiful fabric! So many gorgeous colors! The fabric are stunning and I love the pictures..